Accueil du site > Annuaire > REFFAY-BEUGNON Myriam. 2007-2010 : Postdoc at Laboratoire Physico-Chimie Curie, Paris : Collective cell migration : interplay of Rho-GTPase and mechanical forces. 2004-2007 : PhD at Laboratoire de Physique Statistique. Paris. A biomimetic system of membrane to study protein-protein interaction. M. Reﬀay, Parini M.C., Cochet O., Ladoux B., Buguin A., Camonis J., Silberzan P. Interplay of RhoA and mechanical forces in collective cell migration driven by leader cells. Nat. Cell Biol. 16 (2014) 217-223. M. Reﬀay, Parini M.C., Cochet O., Ladoux B., Buguin A., Camonis J., Silberzan P. Collective cell migration : a fair sharing between leader cells and supracellular coordination. Med. Sci. 30 (2014). G. Rayan, Adrien V., Reﬀay M., Picard M., Ducruix A., Schmutz M., Urbach W., Taulier N. Surf (16)actant bilayers maintain transmembrane protein activity. Biophys. J. 107(5) (2014) 1129-1135. 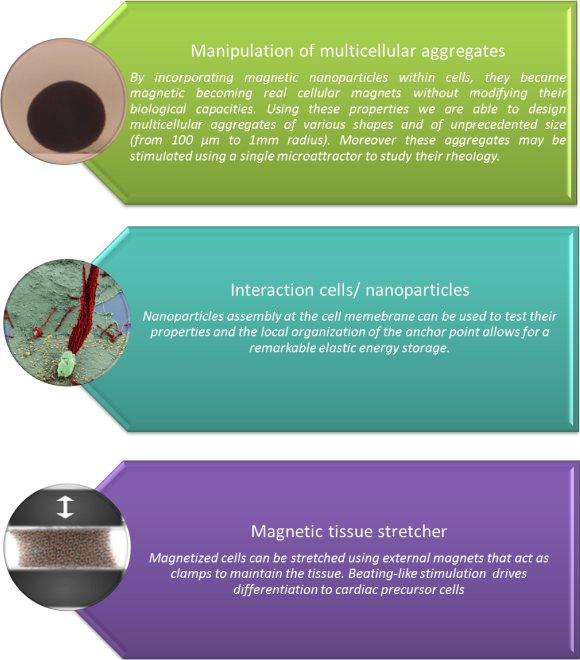 V. Du, Fayol D., Reﬀay M., Luciani N., Bacri J-C., Gay C., Wilhelm C. Magnetic engineering of stable rod-shaped stem cell aggregates : circumventing the pitfall of self-bending. Integr. Biol.7(2) (2015) 170-177. F. Mazuel, Espinosa A, Luciani N, Reﬀay M., Le Borgne R, Motte L, Desboeu (10)fs K, Michel A, Pellegrino T, Lalatonne Y, Wilhelm C. Massive Intracellular Biodegradation of Iron Oxide Nanoparticles Evidenced Magnetically at Single-Endosome and Tissue Levels. ACS Nano 10(8) (2016) 7627-7638. V. Adrien, Rayan G., Reﬀay M., Porcar L., Maldonado A., Ducruix A., Urbach W., Taulier N. Characterization of a Biomimetic Mesophase Composed of Nonionic Surfactants and an Aqueous Solvent. Langmuir 32(40) (2016) 10268-10275. V. Du, Luciani N., Richard S., Mary G., Gay C., Mazuel F., Reﬀay M., Menasché P., Agbulut O., Wilhelm C. A 3D magnetic tissue stretcher for remote mechanical control of embryonic stem cell differentiation. Nat. Comm. 8(1) doi : 10.1038/s41467-017-00543-2. M. Poujade, Grasland-Mongrain E., Petitjean L., Reﬀay M., Buguin A., Ladoux B., Silberzan P. Social life of epithelial cells. Med. Sci.24 (2009), 684-686. M. Reﬀay, Petitjean L., Coscoy S., Grasland-Mongrain E., Amblard F., Buguin A., Silberzan P. Orientation and polarity in collectively migrating cell structures : statics and dynamics. Biophys. J. 100(11) (2011) 2566-2575. Y. Gambin, Lopez-Esparza R., Reﬀay M., Sierecki E., Gov NS., Genest M., Hodges RS., Urbach W. Lateral mobility of proteins in liquid membranes revisited. Proc. Natl Acad. Sci. U.S.A. 103(7) (2006), 2098-2102. M. Reﬀay, Gambin Y., Benabdelhak H., Phan G., Taulier N., Ducruix N., Hodges R.S., Urbach W. Tracking Membrane Protein Association in Model Membranes. PLoS ONE 4(4) (2009), e5035. Y. Gambin*, Reﬀay, M.*, Sierecki E., Homble F., Hodges RS., Gov NS., Taulier N., Urbach W., Variation of the Lateral Mobility of Transmembrane Peptides with Hydrophobic Mismatch J. Phys. Chem.B114(10) (2010), 3559-3566.